Afghanistan located in the middle of Asia. It has 5000 years of cultural history and was the first cradle of civilization, democracy and economic activity. Balkh was one of the oldest and biggest city and is called the mother of cities. Afghanistan had network of scientific centres, universities, and Institutes from which thousands of students graduated and worked for the development of Afghanistan. Unfortunately during the last 20 years war our way of life has been destroyed. Many of our educated people, artists and government employee have emigrated to Europe, America, Canada and Australia. Over 3 million people went to Iran and Pakistan. A number of Afghan families living in Ireland they were Afghan government employees such as teacher doctors engineer artist and have no political affiliation so they come together and set up a community in the name of (Afghan Community and cultural Association of Ireland). Afghanistan is a land locked country which is located approximately in the center of Asia. It is bordered by Iran and Turkmenistan in the southeast, by Pakistan in the west, Uzbekistan and Tajikistan in the north and by China in the northeast. Afghanistan has 35 provinces with an area of 647500 Km square and population estimated 32,738000. Kabul is its capital city. There are different tribes such as Tajik, Pashtoon, Uzbek, Hazareh, Sehks and Hindu who are integrated very well in the society. Balkh province was one of the oldest and biggest cities and is called (Omolbelad) mother of city. 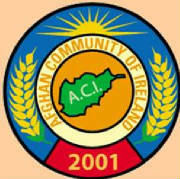 Afghan community is the smallest community in Irish society. Fortunately from the time they arrived in Ireland they are active and integrating in this society.